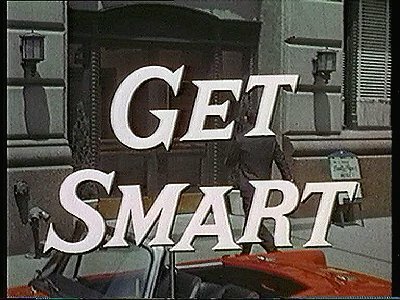 Although Get Smart was set in Washington DC it was filmed in Los Angeles. Strangely four different locations of Control Headquarters were used in the opening sequences of the original tv series, not to mention the follow up movies, the 1995 Fox tv series or the references to the location of Control used in the show. 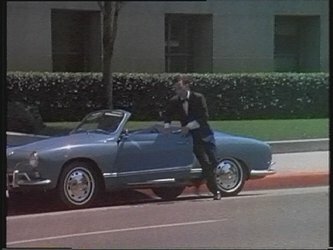 Max exits a dark coloured early 60's Ferrari 250 from a quiet downtown Los Angeles street, throwing his 'mac' hat back into the car and running downstairs to a underground Control Headquarters. Interestingly if you look closely at the black and white original film frame from the 1st episode at the top right you can make out the word 'California'. 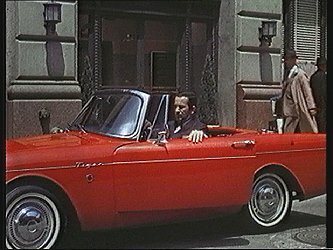 Max drives his red 1965 Sunbeam Tiger along a busy city street (a Paramount Studios lot) and enters Headquarters from an office building. 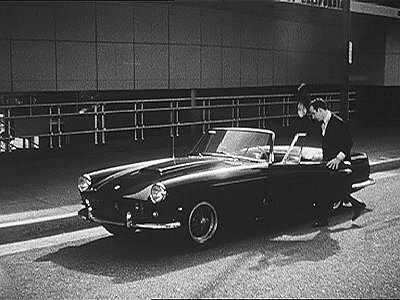 Curiously a look-a-like, 4-cylinder Sunbeam Alpine, with Tiger chrome badges and striping added, was used in place of the V-8 powered Tiger in virtually all scenes during the show itself. This time Max drives his gold 1969 Opel GT along a city street and then runs up the steps of a large bank type building. Back in a red Alfa Romeo and again a Los Angeles street similar to the 1965/66 season opening sequence.